Howard Marks of Oaktree Capital has recently released his updated view on the current market environment. The view of Oaktree is interesting, as they invest across most asset classes and in every part of the capital structure. That investment flexibility gives them front row seat to see how demand and supply dynamics are affecting various parts of the market. At the moment their overriding theme in their view is “too much money chasing too few deals”. "Investors may not feel optimistic, but because the returns available on low-risk investments are so low, they’ve been forced to undertake optimistic-type actions". "Likewise, in order to achieve acceptable results in the low-return world described above, many investors have had to abandon their usual risk aversion and move out the risk curve". "The combination of the need for return and the willingness to bear risk caused large amounts of capital to flow to the smaller niche markets for risk assets offering the possibility of high returns in a low-return world". The effects of more money chasing the same deals are higher prices, lower prospective returns, weaker security structures and increased risk. Loan terms that have never been more accommodative in history. Not even in 2007 were there as high a percentage of “covenant-lite” loans written as there are today (see below). Given that, Howard Marks rightly warns, “Lending standards and credit skills are seldom tested in positive times like we’ve been enjoying. That’s what Warren Buffett had in mind when he said, 'It’s only when the tide goes out that you learn who has been swimming naked'. Skillful, disciplined, careful lenders are likely to get through the next recession and credit crunch. Less-skilled managers may not." Capital equipment company A issued debt to finance its acquisition by a private equity fund. “While we thought the initial price talk was far too tight, the deal was oversubscribed and upsized, and the pricing was tightened by 25 bps. 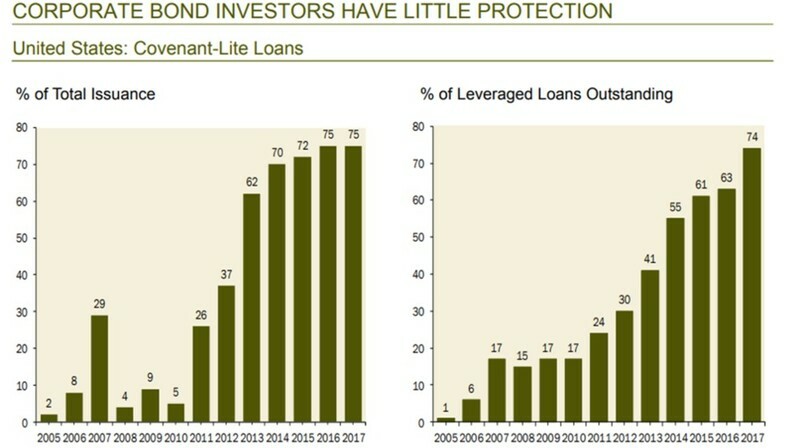 Final terms were highly aggressive with covenant-lite structure, uncapped adjustments to EBITDA, and a large debt incurrence capacity.” The company missed expectations in the first two quarters after issuance, in reaction to which the first lien loan traded down by as much as five points and the high yield bonds traded down by as much as 15. A year ago, a buyout fund financed the acquisition of company G by one of its portfolio companies with 100% debt and took out a dividend for itself. The deal was marketed with an adjusted EBITDA figure that was 190% of the company’s reported EBITDA. Based on the adjusted figure, total leverage was more than 7x, and based on the reported figure it was 13.5x. The bonds are now trading above par, and the yield spread to worst on the first lien notes is below 250 bps. Company H is a good, growing company that we were ready to exit, and our bankers sent out 100 “teasers.” We received 35 indications of interest: three from strategic buyers and 32 from financial sponsors. “The strategic buyers offered the lowest valuations; it’s always a big warning sign when financial sponsors with no hope of synergies are offering prices much higher than strategics.” We received four purchase offers from buyout funds, one with the price left blank. We ended up selling at 14x EBITDA, with total leverage of more than 7x. In 2017, investors bought over $10 billion of debt from Argentine and Turkish local-currency-earning corporates that now trades, on average, 500 bps wider than at issuance (e.g., at an 11% yield today versus 6% at issue). The high point in emerging market debt (or was it the low point?) was Argentina’s ability in June 2017 to issue $2.75 billion of oversubscribed 100-year bonds despite a financial history marked by crises in 1980, 1982, 1984, 1987, 1989 and 2001. The bond was priced at 90 for a yield of 7.92%. Now it’s trading at 75, implying a mark-down of 17% in 16 months.